Modern engineering frequently utilizes complex computer modeling as a tool to aid in design and analysis. The mathematical representation, assumptions, and numerical schemes are often only known by the individual developers and not readily transparent to the end user. The potential pitfall of using complex codes arises from the temptation to assume the results are accurate because output was provided and the software did not provide any error or warning messages. This is, in-fact, the point where engineers need to be most cautious to ensure that they fully understand the underlying physics. This often involves independent verification using alternate software tools, hand calculations, and expert review. 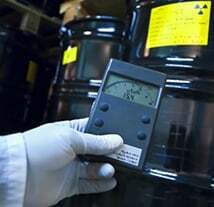 Recently, Fauske & Associates, LLC (FAI) supported a customer request to verify room heatup results, under buoyancy dominated flows, from a standard code used in the nuclear industry for containment analysis (GOTHICTM, owned and licensed by the Electric Power Research Institute, EPRI). This was done using FAI’s internally developed FATE (Facility Flow, Aerosol, Thermal, and Explosion) software package for the prediction of environmental conditions within a facility. Prediction of environmental conditions within a compartment is an important consideration when designing and locating safety equipment. 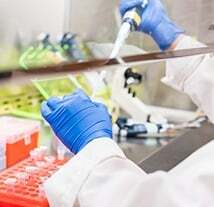 Ensuring that safety system components are designed and manufactured to survive within the expected environmental conditions is a critical first step to ensuring the safe operation of the facility. In the nuclear industry, GOTHIC is a standard engineering tool used to predict environmental conditions that develop in a compartment due to the combined effects of heat sources, heat sinks, and flows in and out of the compartment boundaries. It contains many useful correlations and features to model buoyancy dominated flows. In the loss of ventilation scenario analysis, the compartment was subdivided in order to predict the local gas temperatures where critical components are located. This introduces a large source of complexity when attempting to analyze and use the results to make informed decisions. When sub-nodalizing a volume in GOTHIC, a question that must be resolved is: Are the results predicting buoyancy driven flows or are small numerical differences between the sub-compartment densities generating “phantom” flows? Answering this question is crucial when attempting to use the results to make predictions and inform decisions regarding the safe operation of a facility. 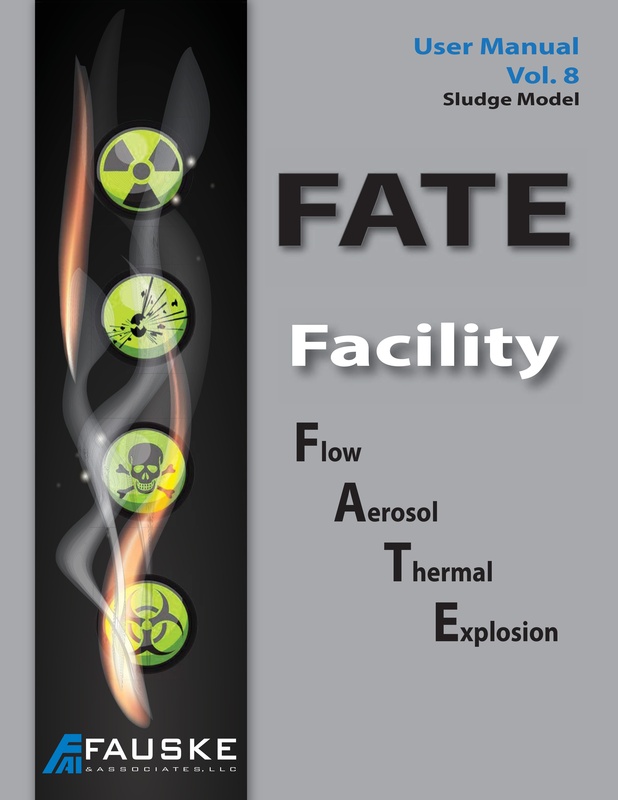 The FATE software, developed under FAI’s nuclear QA program and recognized by a Department of Energy (DOE) technology innovation award, is a flexible, fast-running code capable of modeling a wide range of engineering problems for processes and facilities. It was designed to model heat and mass transfer, fluid flow, and aerosol behavior within a facility and has been used in a broad variety of applications, from post-Fukushima hydrogen assessments to DOE facility safety analysis. The code can simulate common components such as heat exchangers, pumps, fans, filter trains, valves, dampers, blow-out panels, downcomer vents and rupture disks. 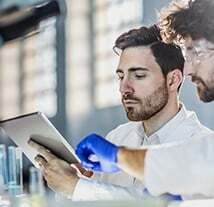 It is an independently developed code which contains alternate models for the flow and heat transfer phenomena occurring in a facility, which makes it an ideal tool to independently verify results generated from other models. The analyzed scenario is an environmental prediction, i.e. transient temperature, of a facility compartment with a large heat source (diesel generator, pump, motor, etc.) which is activated to perform a safety function. In the scenario, it is assumed that all forced ventilation of the compartment has failed, due to a loss of electrical power. In order to provide cooling to the compartment, doors are propped open to provide buoyancy driven flow through communication with the relatively cooler outside environment. The following list provides the critical modeling inputs which were included in the analysis. The models were essentially identical in regards to this input list with the exception of the compartment volume nodalization. The total compartment volume was identical but GOTHIC requires the compartment volume to be sub-nodalized to best predict the temperature distribution in the compartment and the buoyancy driven flow at the open boundary conditions, whereas FATE assumes a single compartment volume. Figure 1 compares the average gas temperature in the compartment predicted by the two models. 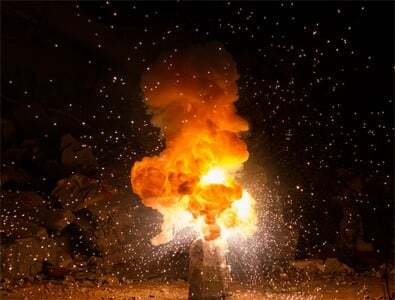 FATE predicted a maximum room temperature of approximately 160oF, whereas GOTHIC predicted a maximum of approximately 150oF (based on the sub-nodalized volume with the higher temperature). In general, both models show the same general trend for the average gas temperature. 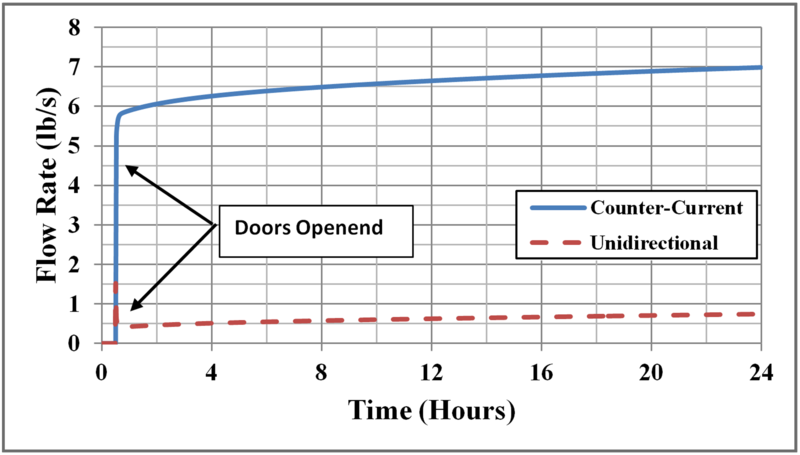 The differences in temperature are mainly attributable to differences in heat source modeling during the initial (prior to doors being propped open) portion of the transient. In the original transient analysis, the main heat source (equipment) was allowed to increase from an ambient condition to full operating temperature over a period of time (linearly ramped). For convenience (quick turnaround) the verification model simply used the full operating temperature as a boundary condition during this initial time period. Therefore, during the early part of the transient, the simplified model as expected predicts a higher average gas temperature. This difference can be seen in Figure 1 and the initial difference persists throughout the entire transient. It is interesting to note that at the end of the simulation, the constant heat load was nearly identical (approximately 2% difference) to the fixed and variable heat loads in the original model, again providing further confidence that both models were predicting similar heat losses via the structural heat sinks and propped open doors. Figure 2 depicts the thermal wave which moves through a large structural heat sink, such as a concrete wall in the compartment. As expected, the results show that the inner surface of the wall begins to increase in temperature as the room gas temperature increases. A temperature profile through the heat sink develops as the transient progresses. 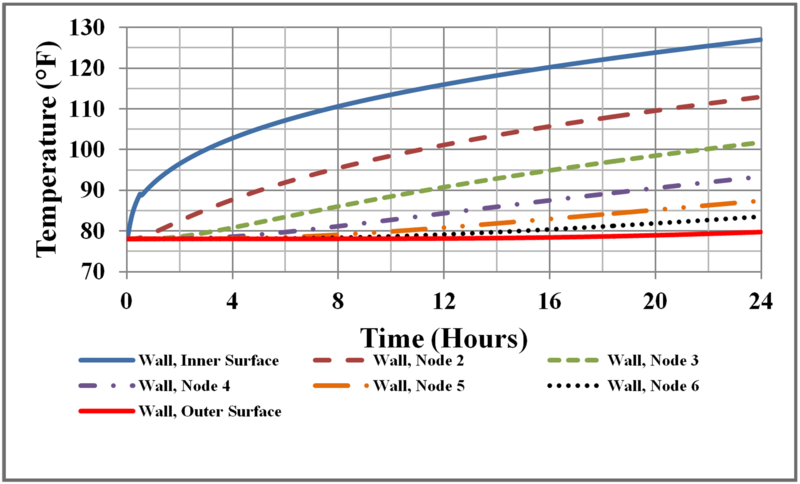 The results show that the temperature gradient fully penetrates to the outside of the concrete wall over the 24 hour analysis period. This aligns well with expectations for heat transfer through a large thick concrete heat sink. Figure 3 shows flow predictions for uni-directional and countercurrent flow contributions which occur simultaneously at the propped open doors. As expected, due to the buoyancy driven nature of the problem, the flow across the boundary is dominated by counter-current flow. The treatment of this flow boundary condition is considerably different between the two codes. GOTHIC only models uni-directional flow through a junction; therefore, for natural convection, two junctions are required to ensure that correct counter-current flow is achieved. The challenge in that case comes from specifying the correct loss coefficients for each junction to mimic the counter-current flow. FATE, on the other hand, uses an established and experimentally verified counter-current flow correlation [Epstein, 1988]. Flow across the boundary (via open doors) is the dominant heat loss mechanism; therefore, the reasonable agreement in gas temperature (Figure 1) provides confidence that the two models give consistent results for buoyancy driven flow. The original calculation write-up did not include details such as the strength of the counter-current flow through the doors or the magnitude of heat losses to the walls and ceiling. The FATE results provide detailed accounting of heat flows and the relative importance of various heat removal paths and provide confidence in the GOTHIC calculation. 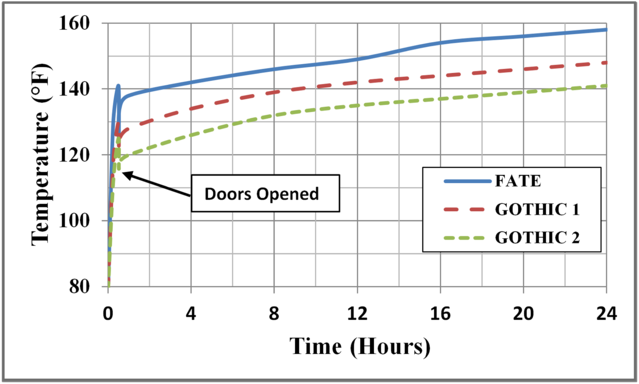 In summary, FAI experts used an independent tool to verify room heatup results and provide confidence that the original analysis is accurately predicting the heat generation, buoyancy driven flows, and heat loss through structural heat sinks. 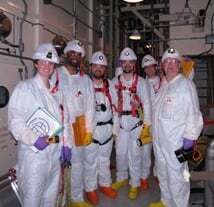 This allows engineers to appropriately design safety system and components, and supports operations so they can make informed decisions regarding the safe operation of the facility under off-nominal conditions. Epstein, M., 1988, “Buoyancy-Driven Exchange Flow Through Small Openings in Horizontal Partitions,” ASME Journal of Heat Transfer, Vol. 110, pp. 885-893, November.